Incorporated in 1994, MARG Group today successfully operates the fully functional ‘MARG Karaikal Port’ having a current capacity of 21 MMTPA. In addition, the Group has developed 1.2 Mil sqft of residential space, delivered 1200 homes and has a customer base of over 4000. The Group is executing 21 major projects worth more than Rs 3800 crores in varied domains through its EPC division. Major developments include a 1.85 million sq.ft. integrated development – 'MARG Junction Mall' and a unique 23 million sq. ft. integrated industrial and services township, 'MARG Swarnabhoomi'. 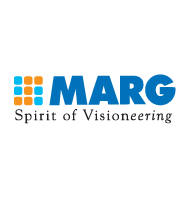 MARG Group is one of India's fastest growing infrastructure organizations and is listed by Dun & Bradstreet as among "India's Top 500 Companies 2011".